The recent influx of data in nearly all facets of life has lead to the coining of the term "data deluge". People with the ability to handle data have now become in high demand in industry. In fact, in October 2012, the Harvard Business Review published an article titled "Data Scientist: The Sexiest Job of the 21st Century". So what is Data Science? It is an interdisciplinary field combining the analytical tools of statistics with data management skills from computer science. 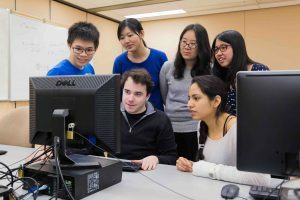 Students interested in pursuing a career in data science are encouraged to combine degrees in Statistics and Computer Science via a Double Major, Major/Minor, or Minor/Major degree. Practical experience handling data would also be considered an asset, so students should consider either internship opportunities or research projects with faculty members with a large data analysis component.